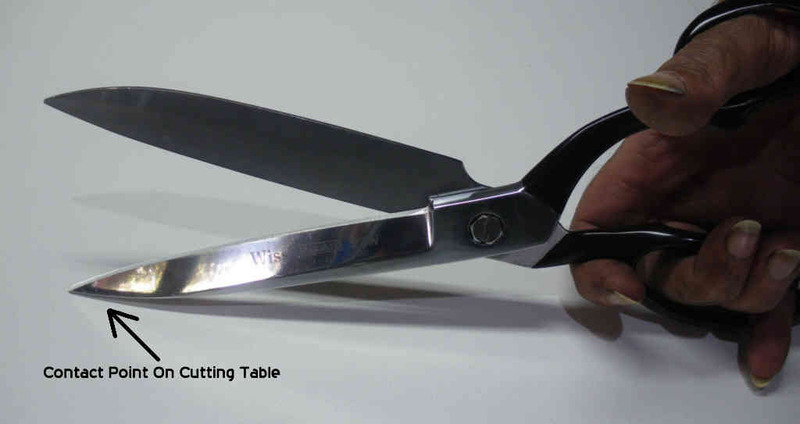 Cutting on a cutting table is a different art than using trimmers freehand, the use of a cutting table gives you many advantages, one of which is the ability to use reasonably large shears to improve your accuracy and cutting speed. There are many ways that people use shears and scissors and none of them are exclusive or "politically correct", what is being explained here is how shears and most scissors were designed to be used. This is a pair of modern Wiss 22w industrial shears that you can buy in many different locations. Probably the best prices are obtained on eBay in the US where you can score a new pair for about $50.00 US. Shipping of course will be extra. They are neither glamorous nor elegant but they are very strong, made with modern steel and are both powerful and accurate. You finally pick the shears you want to use on a cutting table by whether you can comfortably pick them up but there is a magic rule with shears that you use on a cutting table, bigger is always better in terms of precision and lower cutting effort. For the finer parts or complex small curves you would normally use a pair of trimmers. 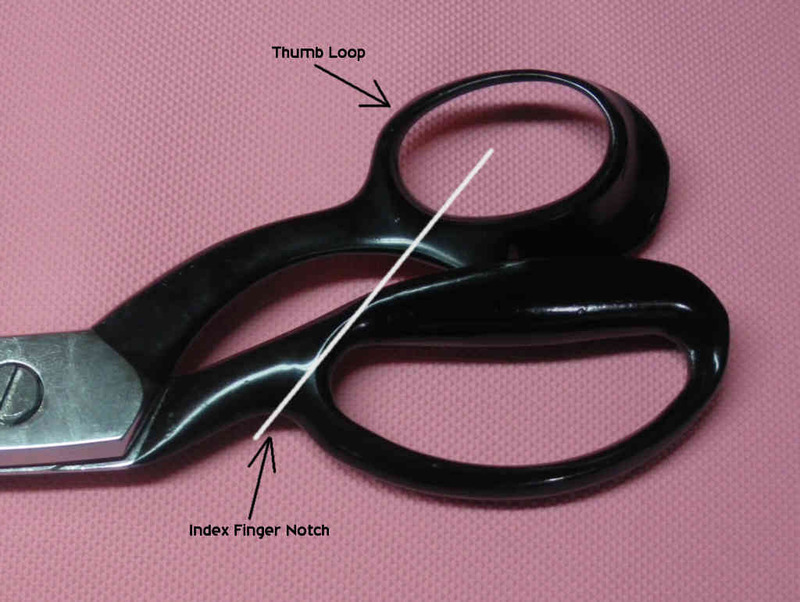 There is a good reason why shears and scissors have the notch before the lower finger loops, its so you can position your thumb in the right place in the upper thumb loop by pulling with your index finger. This is a deliberate ergonomic in the design of scissors and shears so that your hand ends up in the right place with the maximum of control and lower cutting effort. The white line shows the line of force as you close your shears/scissors and why the index finger notch is located in that position. This is how you normally hold a pair of shears while cutting on a cutting table, index finger in the notch, the next three fingers in the lower finger loop and the thumb pulled into the right place in the thumb loop. Among the advantages of holding a pair of shears in the way they were designed to be used is that you get the maximum opening which allows you to make longer cuts with a higher level of accuracy. NOTE that the contact position on the table is marked so you understand where the weight is being carried. The contact point also acts as your pivot point and with practice your accuracy improves as you use the length of the shears from you hand position to the contact point as a lever in cutting curves. This is your normal cutting position on a cutting table, the front of the lower blade resting on the table and taking the weight of the shears and when necessary with a thick seam or similar to cut, you can rest the bottom of the lower finger loop on the table to press harder. As an aside note, with a direct comparison with a very good condition pair of Wiss 4N antique shears, this pair of modern Wiss 22w outperform them in terms of power and cutting effort. The advantages of the traditional Wiss and similar shears only comes with the large sizes where they are much stronger and have longer cutting blades. You use the traditional shears at the expensive of much higher weight. PS: Please forgive the grubby hand, I had just finished cleaning up my cutting table after building a new computer on it and it was a bit of a mess. If you are interested in using traditional tailor's shears you can find the site here. Because the finger loop is large on my biggest shears, I have a tendency to pop the index finger inside the loop rather than the notch. You see many tailors with the finger inside the loop. 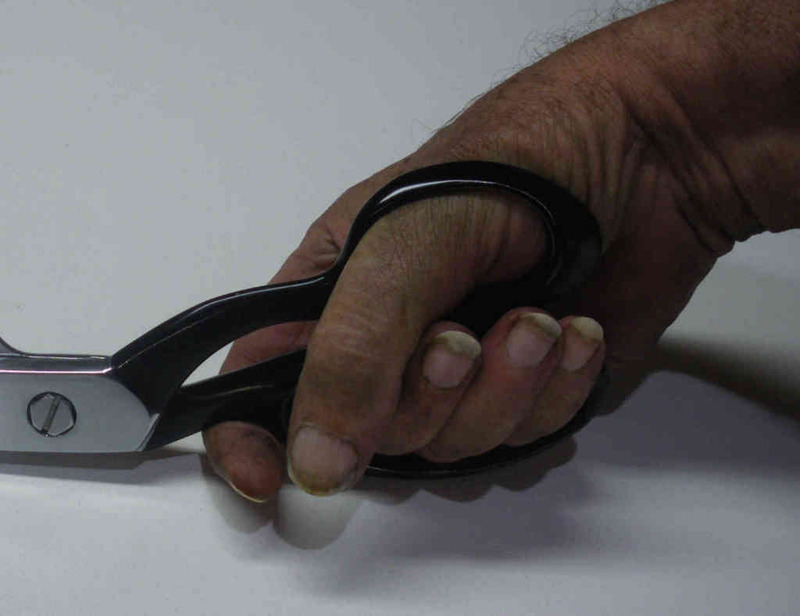 It is common to see this type of variation as many people have learnt to use shears in many different way, all of which are correct if it does the job for the user. What is addressed here is how the shears were designed to be used and why they were designed that way. There was a member of C&T who used right hand big shears left handed and he was used to doing it but it was hardly the way they were designed to be used. Oh yes, I readily acknowledge that it is the way they have been designed to be used. On newer shears I have the finger loop is longer and less rounded than the one on my old shears, even though the blades are shorter on the new ones. I just tried both hand positions on both pairs and having the finger in the notch on the old pair feels fine; on the newer ones it feels odd. You can get the Wiss 22W, 12" shears from Wawak on sale for about $39.95 USD, plus shipping unless you order a larger amount of items. I am not sure of their quality you will receive for this price though. Has anyone bought and used these before? > Has anyone bought and used these before? Yes I have, I own a couple of pairs of modern Wiss 22w shears and they are well made and cut well, that is why I used a pair in the example above.